Dzambhala is a dharmapala, a protector for practitioners who wish to follow the Buddha Dharma. More specifically, he protects and aids those who wish to practice but lack the necessary resources to do so. His name, compounded from the words dzam, meaning “deity”, bhah for “gold or wealth” and la, meaning “to honor”, means “precious golden deity”. One of the stories about Dzambhala is set at the time when Buddha Sakyamuni was teaching about the Mahaprajnaparamita Sutra. While Buddha was teaching, the jealous Devadatta threw boulders at the Buddha. Dzambhala saw this and, in order to protect his guru and without thinking about his own safety, stepped in front of Buddha and blocked them. The boulders cracked apart as they hit Dzambhala. One of the flying pieces hit him in the head, causing him to collapse to the ground. 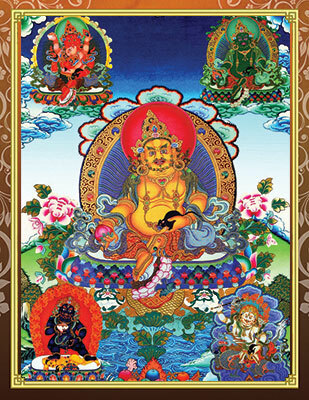 Among the different forms of Dzambhala, the five most common are Yellow Dzambhala, White Dzambhala, Green Dhambhala, Red Dzambhala, and Black Dzambhala. Each form is an emanation of a different Buddha or Bodhisattva, has his own Buddha activity, and works on different aspects of the human consciousness in order develop the enlightened awareness necessary for reaching Buddhahood. The puja of the Five Dzambhalas provides a unique opportunity to generate an immense amount of merits for developing the prosperity and gratitude that go with an enlightened attitude. It gives participants the blessings of abundance for all resources needed in order to continue on the path of Dharma. In this sense, the Dzambhalas bestow not only financial prosperity but also the abundance of time and energy needed to practice the Dharma, Dharma friends who can help us on the journey to enlightenment, and any other resource that may be needed by practitioners in order for them to develop bodhicitta. gratitude, and other qualities exemplified by the Dzambhalas. The skillful means provided by the puja, empowerment, and practice of the Dzambhalas work best with the right intention of developing bodhicitta to reach enlightenment for the benefit of all sentient beings. Yellow Dzambhala, the most well-known of the Five Dzambhalas, is an emanation of Buddha Ratnasambhava, the Buddha of Giving. His body is the yellow color of the ratna or jewel family of Buddhas. He is seated on a lotus throne in vajra position, right leg slightly forward with foot resting on a shell on top of a lotus. In his right hand, he holds a gem-shaped fruit and a lotus leaf. His left hand holds a mongoose that spits out precious, wish-fulfilling jewels. He is known for purifying karma related to poverty within the six realms (hell realm, hungry ghosts realm, animal realm, human realm, asura realm, and god realm) and for increasing health, virtues, and wisdom. 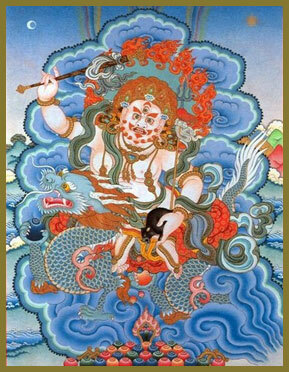 White Dzambhala is an emanation of Chenrezig, Bodhisattva of Compassion and was born from Chenrezig's right eye. He is depicted sitting on either a snow lion or a dragon. His body is pure white. He has a wealth banner in his left arm and in his left hand sits a mongoose who spits out precious jewels. His right hand holds a golden sword. He has the ability to remove suffering caused by poverty and helps to purify non-virtuous karma and karmic obstacles that block prosperity. He helps to avert sickness and disasters and aids devotees in developing bodhicitta. 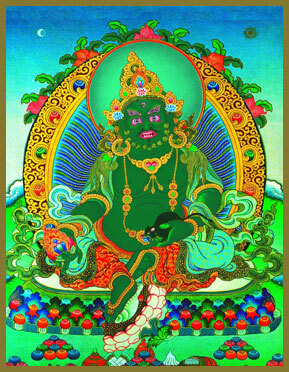 Green Dzambhala is chief of the Dzambhalas and an emanation of Buddha Akshobya. His body is green and he sits on a lotus throne in vajra position, right leg in front with the foot resting on a shell atop a lotus flower. In his right hand he holds a norbu or wish-fulfilling jewel and in his left sits a mongoose who spits out even more wish-fulfilling jewels and precious ornaments. He benefits sentient beings who suffer from poverty and enables the perfect accomplishment of Dharma activities. He purifies karma that bring obstacles and bad luck and provides protection against all forms of loss of wealth. 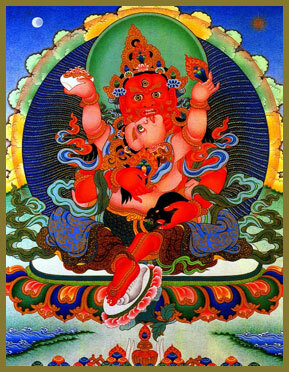 Red Dzambhala is an emanation of Vajrasattva, the Boddhisattva of Purification. His skin is red, the color of the Buddhas' magnetizing activity. Seated on his lotus throne in vajra position with his right leg forward, foot on a shell and lotus flower, he is often shown together with his consort, the heavenly mother of wealth in the human realm. 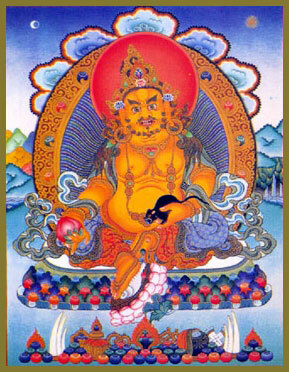 In his right hand, he holds a norbu or wish-fulfilling jewel and in his left rests a treasure mongoose. In his consort's left hand is a kapala containing amrita or the nectar of immortality and in her right, she also holds a norbu. His practice focuses on the magnetizing aspect of Buddha's activities, granting devotees the ability to attract the resources they need and people who can help them in order to continue their practice of the Dharma. 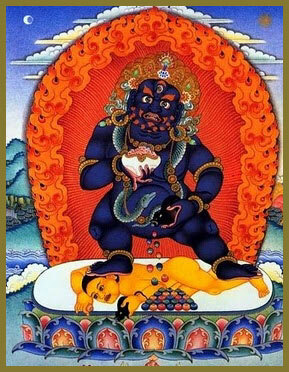 Black Dzambhala is an emanation of the Buddha Amoghasiddhi. His skin is black and he wears a snake necklace around his neck. He is often depicted standing over a human corpse, symbolizing subjugation of human greed and ego. In his right hand is a kapala filled with precious jewels and in his left is the wish-fulfilling-jewel-spitting mongoose. Also known as Kubera, he benefits all beings suffering from material and spiritual poverty and those with virtuous minds who are in solitary retreat.